The book is generally about the development of the idea of open source coded softwares. The author discusses the differences between close source coded softwares and open source coded ones. 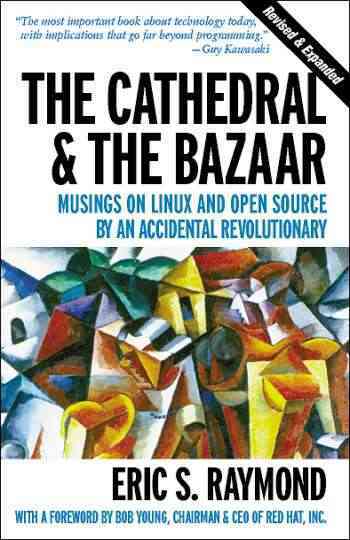 Actually the name of the book is just the comparison : the cathedral stands for close source code, and the bazaar stands for open source. When a software is close source coded, it means that it is only available to a certain group of software developers. However, when it is open source coded, it is available to all people on the Internet. The book also touches some important points about free software companies and projects such as GNU Linux and Fetchmail. The book generally focuses on the project from the user’s point of view. It suggests that the open source coded projects should be renewable and reusable. The projects should be promising for the future technologies, so the developers will be more supportive. However, this doesn’t mean that the project should be perfect in all terms, on the contrary it should be easy to deal with and as plain as possible. Another point is that the project should be updated frequently.So if the project is achievable, then there is no problem with using open source code.